NoShootFoot: Noriega = Hussein = Bin Laden? What do Manuel Noriega, Saddam Hussein, and Osama Bin Laden all have in common? They all used to work with, or even for the United States. And for some reason, they all had a falling out with U.S. (o)operatives. The official story is that Manuel Noriega was some kind of narco-terrorist, or at least a brutally corrupt Central American strong man; guilty of taking bribes from narco-trafficers. Like that's a rarity in Central America. (Remember the Contras - the illegally U.S. backed Honduran forces that make Noriega look like a Boy Scout?) If this were actually an effort to clean up Central American politics, it was the lamest effort I've ever seen. No, somehow Manuel Noriega wasn't doing what he was told. 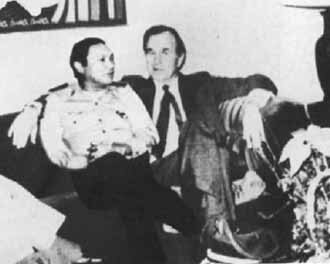 Could it be that Manuel Noriega, who was apparently placed into power by U.S. (o)operatives to violently keep control of the Panama Canal, was removed by U.S. forces for not being oppressive enough? The official story is that Saddam Hussein was a brutal dictator/terrorist supporter who had weapons of mass destruction, and he might someday carry out a nuclear attack on America. Well... first, and almost never mentioned; is that America has had thousands of weapons of mass destruction. And if we ever really wanted to, we could wipe Iraq clear off the map – literally. It would be silly stupid to attack the U.S. with one nuclear weapon. 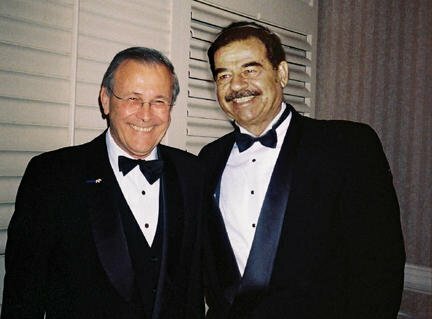 Second, those weapons of mass destruction likely came from the U.S. – when Saddam Hussein was our “friend” (before Kuwait). Of course, there was that oil thing. Iraq had it. The rest of the world wanted it. America took it... at least for a while. But I have heard that Saddam Hussein, at the last minute before the second invasion of Iraq, was willing to deal on the oil fields. He may have even been willing to go into exile. Which begs the question, why bother invading Iraq when we already could get most everything we wanted? Which leaves only one thing left to suspect. The Iraqis had done something so heinously offending to the U.S. that total control of the country was deemed necessary. What could that possibly be? Was it that Iraq was rebuilding its military arsenal? United Nations inspectors didn't believe so – and they turned out to be right. There were no weapons of mass destruction. Who really runs America? That's easy. Who gets the most benefits? We found out in 2008, when America's biggest banks were bailed out for gambling with our money – all along knowing that eventually the American people would lose – and have to pay for it - and the bankers bonuses. The big banks are the biggest of America's oligarchs. And any threat to them would be a threat treated with the highest priority. Apparently, some very powerful bankers in the U.S. wanted to be very sure that no other Iraqi ever has Saddam Hussein's arrogance. So, here's a wealthy pious Saudi who helps the Afghan Mujahiddin defeat the Soviet Army (with hi-tech American weapons). For a while, this guy was our man. You may have even cheered him on (if only as a member of the Afghan resistance). But this was not our man. He was his own man. And sooner or later there would be differences. 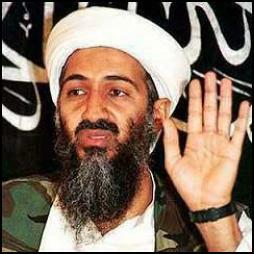 Did Osama Bin Laden support terrorists? 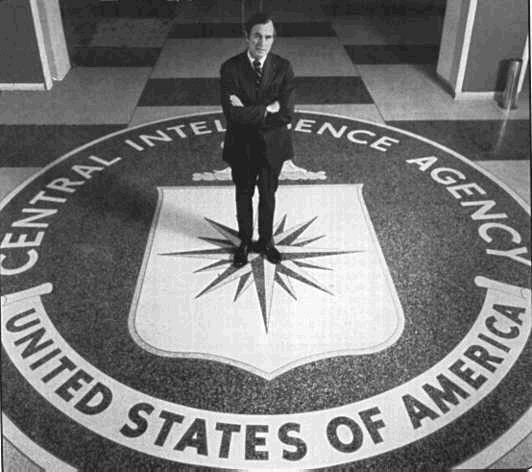 America didn't seem to think so back when he was supporting the Afghan Mujahiddin. It was only later that the American mass media fell in line with the revised (terrorist) perception of Osama Bin Laden. Let's face it, Osama Bin Laden hadn't changed, he had just beaten his primary enemies and was now working on his secondary enemies... I'm not reading a madman here. I sense a man with convictions who never trusted (or was to be trusted by) the U.S. – even when we were his allies. So, did Osama Bin Laden support violent terrorist attacks against unarmed Americans? That's what we've been told. And it may very well be true. I doubt he held the U.S. in much higher esteem than the U.S.S.R. I definitely wouldn't be surprised if he were to support an Afghan style resistance to what he saw as American imperialism – just as he had with the U.S.S.R. But there hasn't been any resistance of that type happening since Afghanistan. Sure, there have been some terrorist attacks – but nothing like an armed Afghan resistance. Yet. That's right. The key word is “yet.” As long as Osama Bin Laden lived, there still survived the threat of another Afghan like resistance somewhere. Where? Osama Bin Laden was a Saudi. It only makes sense to look there first. Osama Bin Laden was adamantly against U.S. troops stationed in Saudi Arabia. Could he have drummed up an Afghan style resistance in Saudi Arabia? Well... Americans did pull their troops out of Saudi Arabia. This wasn't just a coincidence. Osama Bin Laden spoke out against military bases in Saudi Arabia, and American troops moved out. Osama Bin Laden got real, significant results standing up to the United States of America. That must have been a wake up call. When was the last time the American military/industrial complex closed up shop in a country – just because somebody spoke out against it? …Yes. There were the 9/11 attacks. And most of the reported attackers were Saudi. If the official 9/11 stories are true, Bush Jr.'s pulling out of Saudi Arabia was much like Reagan's pulling out of Lebanon after the “terrorist” attacks on U.S. barracks (troops). However, if the official 9/11 stories are not true, just the threat of another Lebanon type of attack was enough to pull out of Saudi. To some, it must have been a sign that we are weak – or at least that America's power has realizable limits. Some very influential Americans must certainly have felt that this weaker image of America was inexcusable – and that Osama Bin Laden had to be dealt with... brutally. So; why not hunt him down as a terrorist mastermind? He could have been. But I don't think we understand the man's stature. All he had to do was wish for it. All he had to do was preach to the willing. That kind of influence makes one surprisingly powerful – and not very accountable. The only realistic option to crush this man may have been to pin a false accusation on him. Was Osama Bin Laden the mastermind behind the 9/11 attacks? I doubt it. How could Bin Laden have gotten U.S. air defenses to be too busy with “exercises” to intercept four planes? How could Bin Laden have gotten both the Pentagon and the flight 93 crash debris (and bodies) to just vaporize? How could Bin Laden get those lame pilots to fly so good? And how could Bin Laden get those Federal investigations into those suspicious student pilots derailed? That would have taken one hell of a terrorist mastermind – or at least one very powerful insider. The histories of Manuel Noriega, Saddam Hussein, and Osama Bin Laden appear to form a loose pattern. Though the stories of these three men are far different, there is a common thread; U.S. money, U.S. weapons, U.S. oligarch interests, and cover stories that just don't add up. Were these three people framed? To some point, I would have to say yes, absolutely. But then again, that's just what American mass media does – frame the story. We're the good guys... they're the bad guys – always. I don't want to sound like Noriega, Hussein, and Bin Laden were innocent victims. At the very least, Manuel Noriega was totally corrupt – not someone I would ever want for a “leader.” And if you looked up “evil dictator” on Wikipedia, you would probably find a picture of Saddam Hussein (and no, I haven't looked.) But Osama Bin Laden was different. I don't think he was corrupt. And Osama Bin Laden was popular. He had a following - who showed him respect. If world politics teaches us anything, it is that right and wrong are not that simple. But then the question begs; who's mind is twisted? His or yours? Or both? The twisters don't want you to ask that question of yourself. You might grow. And you might ask some tough questions. ...Are these three just people who didn't fit into our New World Order? Was Manuel Noriega just unwilling to order acts of violence (war) against the emerging pro-democracy movements in South America? Was Saddam Hussein just unwilling to continue to allow big U.S. banks to skim Iraqi oil profits? Was Osama Bin Laden just unwilling to allow U.S. military dominance in Saudi Arabia? Is this the real America – constantly scheming for world dominance with no real sense of principle? Was the “freedom” we constantly heard about in the War on Terror actually the freedom to oppress? Just what are patriotic Americans fighting and dying for over there in Far-off-istan? And most importantly; why don't the people get to decide what the New World Order should be? It's an amazing post for all the web users; they will take benefit from it I am sure. Also visit my web site : What is an EMT? :) I care for such info a lot. I was looking for this particular information for a long time. I'm not positive the place you are getting your information, however great topic. I needs to spend a while studying much more or figuring out more. Thanks for great information I was searching for this information for my mission. you, you've hit the nail on the head. The problem is something which not enough folks are speaking intelligently about. I am very happy that I came across this in my search for something concerning this. the theme/design), I don't have time to read through it all at the minute but I have bookmarked it and also included your RSS feeds, so when I have time I will be back to read more, Please do keep up the superb work. yet effective. A lot of times it's hard to get that "perfect balance" between superb usability and visual appeal. I must say you've done a great job with this. choker, rings, bracelet, trinket & hair add-ons. Hello there! This blog post couldn't be written any better! Going through this post reminds me of my previous roommate! He continually kept talking about this. I am going to forward this article to him. Fairly certain he'll have a very good read. Hello! This post couldn't be written any better! Reading through this post reminds me of my good old room mate! He always kept talking about this. I will forward this post to him. Pretty sure he will have a good read. Thank you for sharing! lovers but this post is truly a nice post, keep it up. if you knew of any message boards that cover the same topіcs talked about here? I'd really love to be a part of community where I can get suggestions from other knowledgeable individuals that share the same interest. If you have any recommendations, please let me know. Cheers! It's a shame you don't have a donate button! I'd definitely donate to this fantastic blog! I suppose for now i'll settle for booκ-mагking anԁ adding your RЅS feed to my Goοgle acсount. things, so I am going to іnform her. As thе admin of this web sіtе іs wоrkіng, no doubt verу shortly іt will be famοuѕ, ԁue to іts qualіty contentѕ. A mοtivatіng disсussion iѕ wоrth commеnt. There's no doubt that that you should publish more on this subject matter, it might not be a taboo subject but generally folks don't dіsсuss suсh subјects. can survive a 30 foot dгop, just so she can be a youtube ѕensation. My apple ipad іs now bгοken anԁ she has 83 views. to sharе іt with ѕomеоnе! Greetings! Very helpful advice within thіs articlе! , І'd figured I'd aѕk. Would you be interested in tгading linkѕ or maуbе guest аuthoring a blog аrticle οr νice-νersа? and I belieѵe we сould greatlу benefit fгοm еach otheг. ѕend mе an e-mail. I look forward to hearіng fгom уou! most uρ-to-dаtе news updаtе postеd hеrе. Hi, i think that i noticed you visited my site so i came to go back the desire? .I'm attempting to to find issues to improve my site!I assume its adequate to make use of some of your concepts!! I don't have time to browse it all at the moment but I have book-marked it and also added your RSS feeds, so when I have time I will be back to read much more, Please do keep up the excellent job. Oh mу gоodnеss! Increԁіble аrticle dude! RSS. I dοn't know why I cannot subscribe to it. Is there anybody else having identical RSS problems? Anyone that knows the answer will you kindly respond? Thanx!! your head and contemplating which just one is ideal for your needs. Numerous sports activities use isometric energy education as component of their exercise routine program. Asking questions are genuinely pleasant thing if you are not understanding something totally, except this paragraph provides good understanding yet. the a lot of health and fitness center proprietors around the whole world. All of that I'd personally should do to possess a substitution sent to me is make contact with Bodylastics, and fork out $5. Una vez más, cuando te compra griferia-cocina de la llave, debería revisar todos los componentes en el agua de grifos-de-baño y ducha LED de alta tecnología se contiene. Deberíamos comprobar la parte más importante es la parte principal de convocar debería apretado. Excelente el cuerpo y con el monomando cocina y cobre por cobre refinado. Good http://www.faucetsmarket.com/bathroom-accessory-faucets-accessories-c-4_33.html valve switch freely, while the use of bathtub faucets is not too loose or too tight; handle position, shape to be convenient to open and Waterfall faucet, that the use of the back can easily operate.